When I was growing up, on New Year's Day, my family would always bundle up and go to my grandparents' house in South Philly for the Mummers' Parade. My Dad became involved with the Mummers when he was just a boy of 13 and most of my family has been involved with the Mummers at one time or another, so it's kind of a big deal. (Just ask anyone who lives in South Philly!) Anyway, we'd spend the better part of the day outside watching the parade, and then we'd go back to my grandparents' house to have something to eat and to warm up. There was always a great big pot of soup and a huge pot of hot dogs and sauerkraut. It's one of the childhood memories that I'll always hold dear to my heart. Now we don't always make it over to the parade, but we still get together to watch it on TV, usually at Michael and Karen's house. 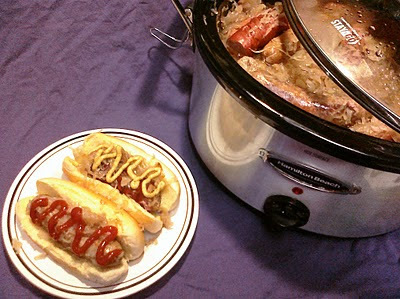 And of course, we still have a great big pot of soup and a huge pot of hot dogs and sauerkraut. It just wouldn't be New Year's Day without it. I got the recipe from my sister Reen who had just given it to her son, Jude, at college. She said to him "Just throw everything in the crock pot and it'll smell like New Year's Day". When she sent it to me she said "Just the smell of it makes me think of Mummers." It's funny because it's true! And every person in my family will tell you the same thing! So give it a try! Invite a big gang of people to your house on New Year's Day and watch the Mummers Parade. You're likely to see my brother Denny's choreography or maybe even hear a musical arrangement by my brother Michael! I suppose you could just throw everything in the crock pot and let it cook, just as Reen said, but I like to saute the onions and brown the sausages a little in a skillet before adding everything to the pot. Throw everything together in the morning while you're watching the Comics and the Fancies. Turn it to low for a few hours, just until the sausages are cooked through, then turn it to warm. It'll be all ready by mid afternoon when you're watching the String Bands and you can let everyone serve themselves right out of the crock pot. It'll keep everything nice and hot. It's so yummy, I bet there won't be any left by the time you get to the Fancy Brigades! Oh, btw, the amounts are just guidelines. If you have a lot of people to feed, just add more! but you could use whatever you want. Whenever I'm having sauerkraut, I always like to add one or two diced apples. I think the sweet helps to balance the sour. If your nose is not particularly fond of sauerkraut, try adding some chopped celery leaves to the pot. Seriously! Add Caraway seeds to the pot if you don't want gas from the sauerkraut...seriously works! !